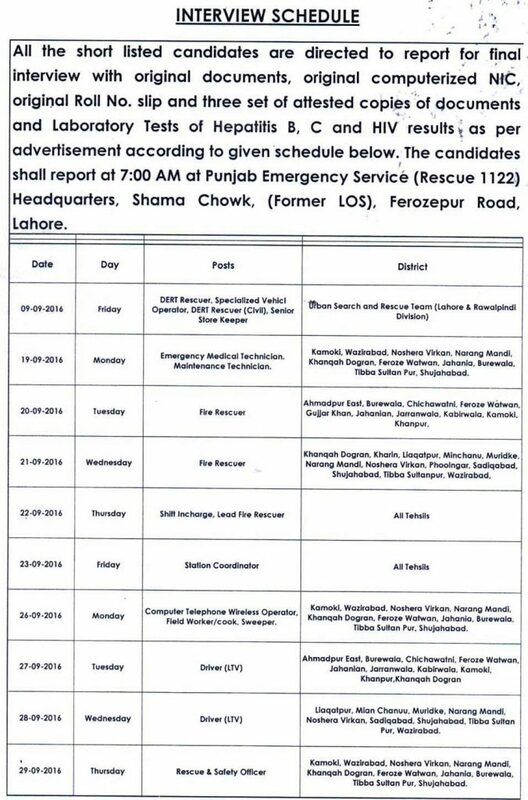 The Punjab Emergency Service Rescue 1122 Drivers CTWO Interview Schedule 2016 dates are missing from NTS Website and the calls are delivering to all other candidates before the interview date. The all LTV drivers and Computer Telephone and Wireless operators (CTWO) Interview Schedule 2016 is here for the candidates to be worry less. All the short listed candidates are directed to report for final interview with original documents, original computerized NIC, original Roll No. slip and three set of attested copies of documents and Laboratory Tests of Hepatitis B, C and HIV results as per advertisement according to given schedule below. The candidates shall report at 7:00 AM at Punjab Emergency Service (Rescue 1122) Headquarters, Shama Chowk, (Former LOS), Ferozepur Road, Lahore. Find here All Rescue 1122 Drivers CTWO Interview Schedule 2016 dates and venue. onine. 19-09-2016 Monday Emergency Medical Technician. Maintenance Technician. Kamoki. Wazirabad. Noshera Virkan. Narang Mandl. Khanqah Dogran. Feroze Watwan. Jahania. Burewala, Tlbba Sultan Pur. Shujahabad. 20-09-2016 Tuesday Fire Rescuer Ahmadpur East. Burewala. Chichawatni. Feroze Watwon. Gujjar Khan. Jahanlan. Jarranwala. Kablrwalo. Kamoki. Khanpur. 21-09-2016 Wednesday Fire Rescuer Khanqah Dogran. Kharin. Llaqatpur. Minchanu. Muridke. Narang Mandl. Noshera Virkan. Phoolngar. Sadlqabad. Shujahabad. Tlbba Sultanpur. Wazirabad. 26-09-2016 Monday Computer Telephone Wireless Operator. Field Worker/cook. Sweeper. Kamoki. Wazirabad. Noshera Virkan. Narang Mandl. Khanqah Dogran. Feroze Watwan. Jahania. Burewala. Tlbba Sultan Pur. Shujahabad. 28-09-2016 Wednesday Driver (LTV) Llaqatpur. Mian Chanuu, Muridke. Narang Mandl. Noshera Virkan, Sadiqabad. Shujahabad. Tlbba Sultan Pur. Wazirabad. 29-09-2016 Thursday Rescue & Safety Officer Kamoki. Wazirabad. Noshera Virkan. Narang Mandl, Khanqah Dogran, Feroze Watwan. Jahania. Burewala. Tlbba Sultan Pur. Shujahabad.